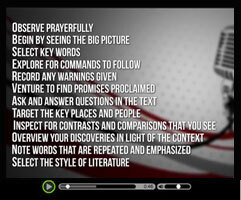 Small Group Bible Study is a forum growing in popularity in America today. Almost every church, particularly the mega-churches looking for a way to encourage intimacy within the congregation, makes some type of small group Bible study available. Small groups offer a place to connect with other believers in fellowship; to grow in our understanding of the Bible, as Jesus' own small group of disciples did; to meet the needs of others in your group in ministry; to become equipped for evangelism; and to worship God through practicing godly behavior. Small Group Bible Study? Why Do I Need That? I Can Study the Bible On My Own! Sound familiar? Maybe that's even what you're thinking right now. And yes, you can study the Bible on your own. In fact, you should! Personal Bible study is essential for deepening your relationship with God. So why study with a group? Because, as Rick Warren says in The Purpose Driven Life, "God didn't create you to be alone." Small Group Bible Study - It Will Transform Your Life! Crosssearch.com defines Small Group Bible Study as: "A moderated study of the Bible, emphasizing small study groups, to insure a peaceful, respectful, and instructive atmosphere for the contemplation of God's Word." That's a great description! But beyond that, a small group Bible study offers a place to connect with other believers, making you part of a family. And when you're in a family you learn to love others, for better or worse. You can't learn how to love on your own. Small Group Bible study also offers a safe place to get your questions answered. If a small group setting is new to you, you'll be surprised how quickly you'll be helping others find answers as well. Asking pastors during weekly church services isn't usually possible or practical, so you may leave fed, but still a little hungry. When you are involved in a small group of other believers with varying backgrounds, chances are at least one other person in that group will be able to answer your specific questions. Certainly, as a group, you can determine to research and find answers to questions that cannot be answered in your regular meeting times. And aren't two or three or more heads better than one? In your small group, you can also share your needs. At first, you may not feel comfortable sharing intimate details of your life, and you don't need to. But small group members exist to care for one another and to join in lifting one another's burdens before the Lord. Even if all you are willing to share is, "pray for me," then at least you can go out with the confidence that someone else is in fact praying for you. And God is listening. Let us not give up meeting together, as some are in the habit of doing, but let us encourage one another--and all the more as you see the Day approaching (Hebrews 10:25). Read Small Group Bible Study Page 2 Now!